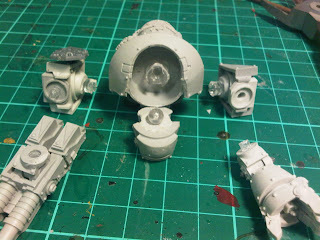 I'm trying to build this dreadnought with as much of the original resin bits as possible. 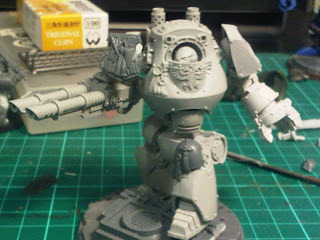 As the pre-heresy dreadnoughts are more humanoid in shape, I didn't want to mess with the proportions like I do with the recycle bin pattern dreadnoughts. 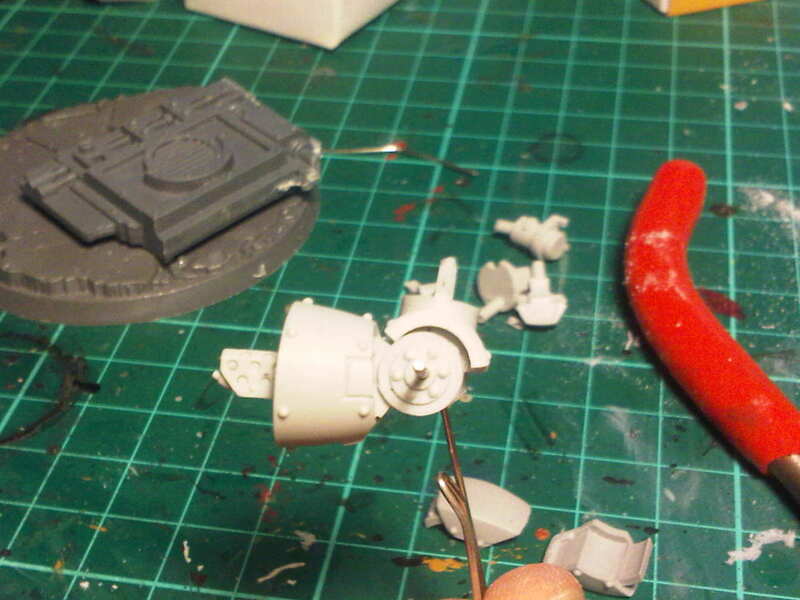 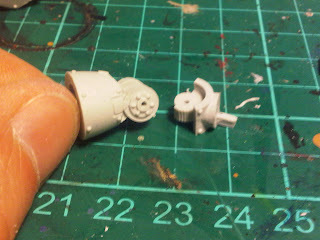 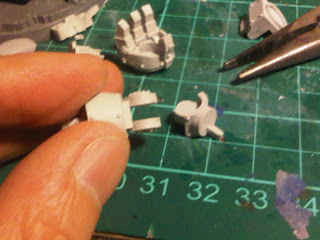 The following pictures showed how I made the arm movable. 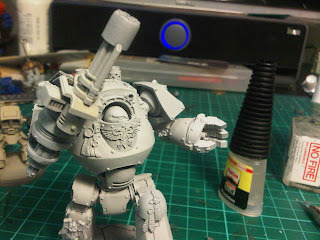 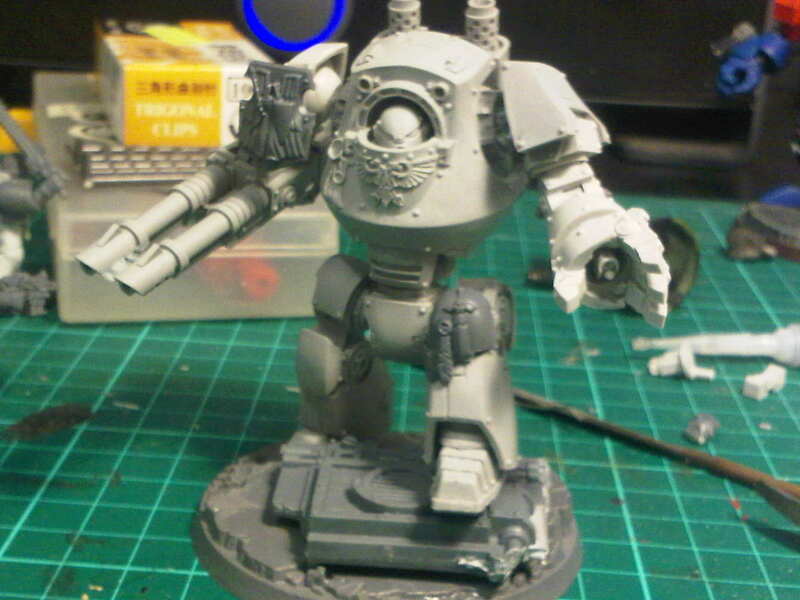 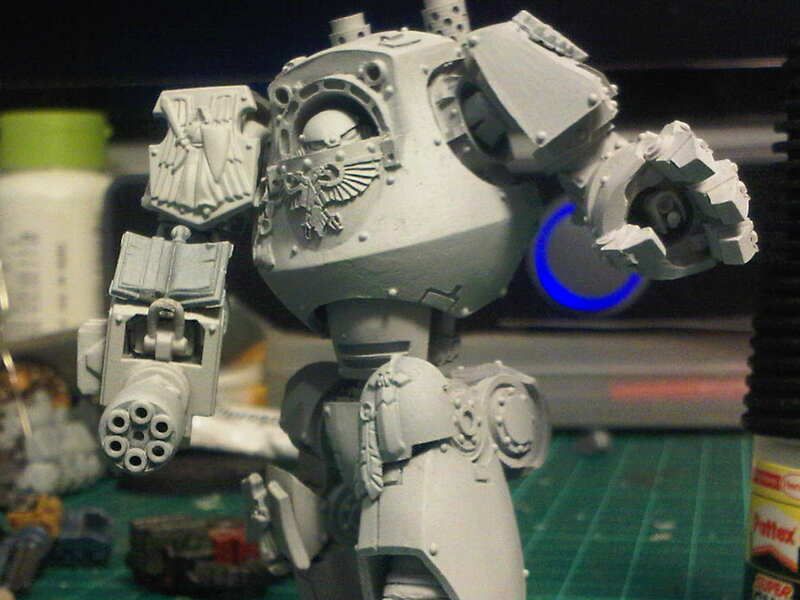 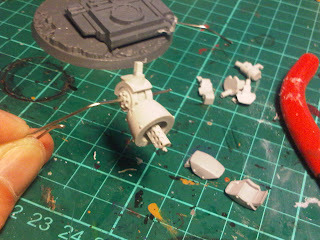 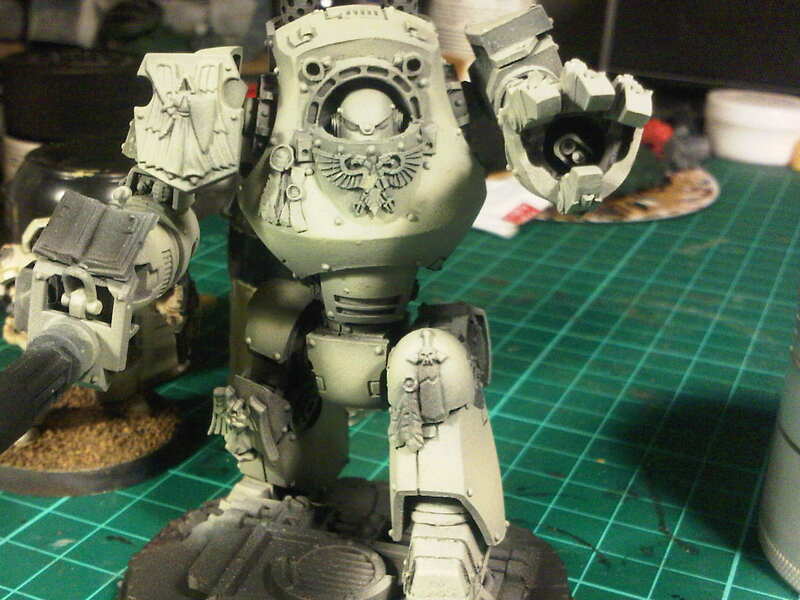 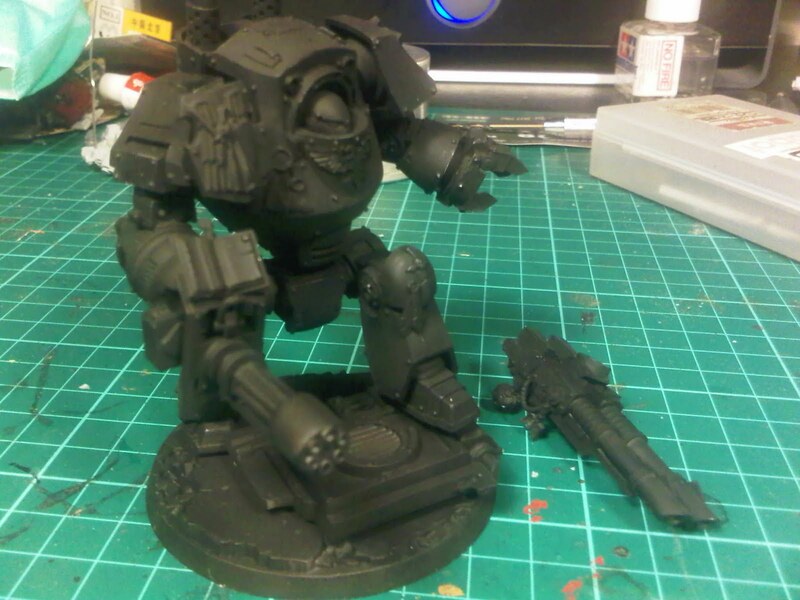 For my contemptor dreadnought, I’ve managed to articulate the entire upper + the head. 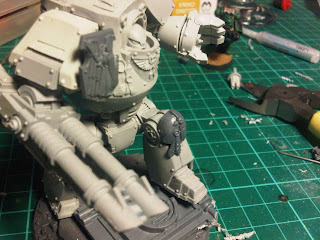 Sadly the thigh and the knee joints were too small for me to effectively bevel out a rectangular niche for to install a joint housing. I tried to pin/glue the legs in a dynamic pose. As for the dreadnought close combat weapon, since a flamer is housed inside the middle of the fist/palm I plan on drilling more holes around the circular forearm bit so that the fist can rotate by plugging into different holes. Still left to do is adding some dark angels bling. 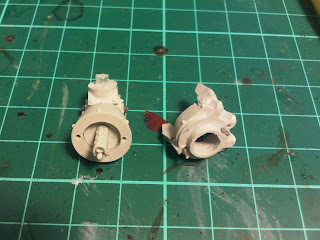 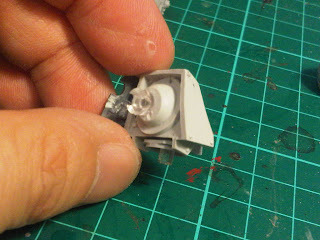 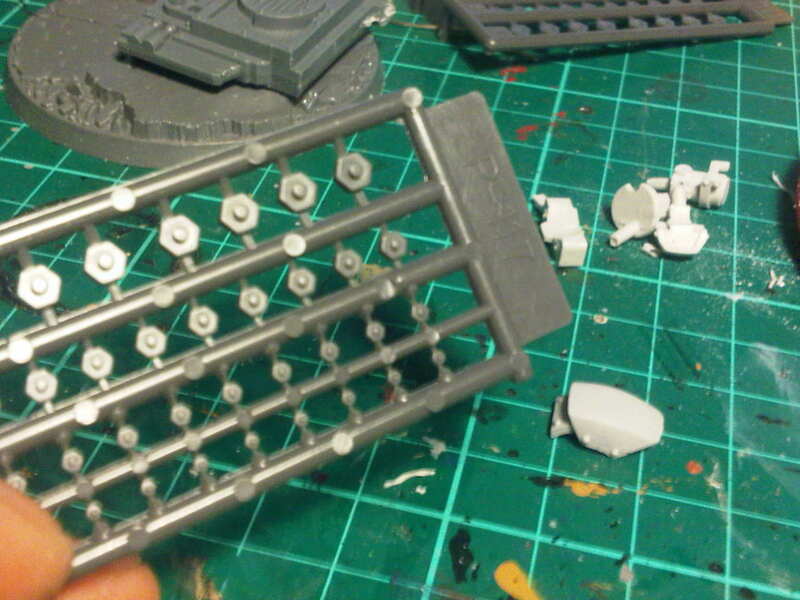 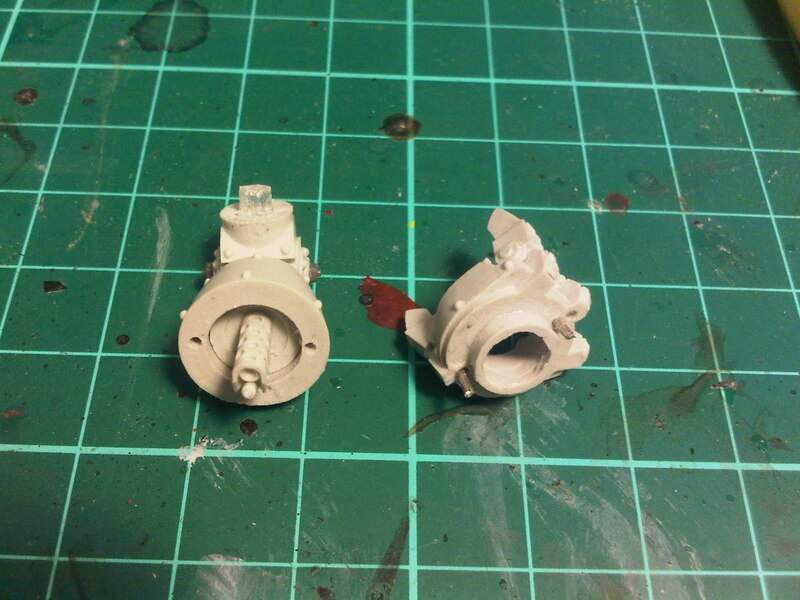 I’ve been having a difficult time finding suitable bits as dark angels only have 1 upgrade sprue to choose from. I think I’ll need to use plenty of blood angel bits to chop/convert. 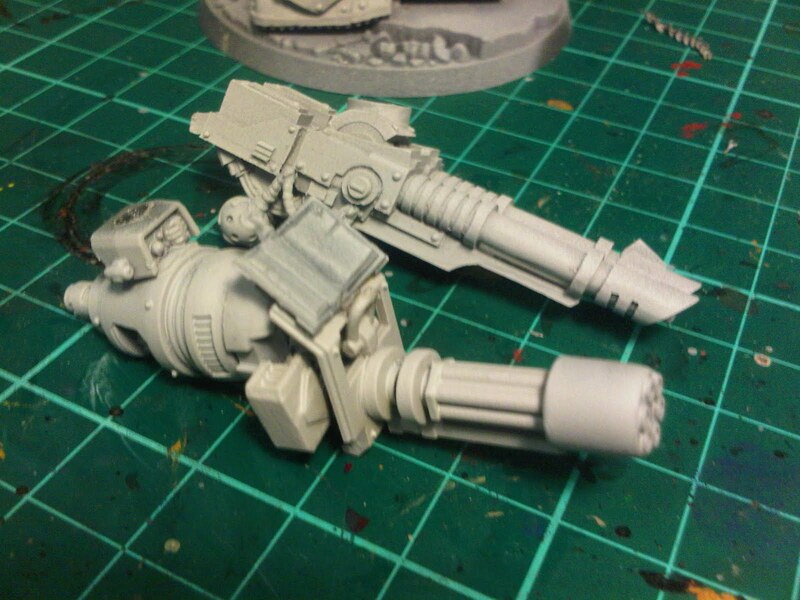 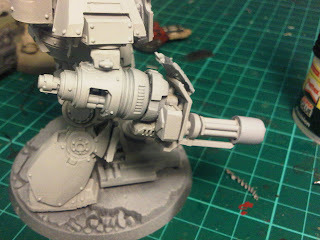 I kitbashed an assault cannon arm from the blood angels furioso kit for my contemptor dreadnought. 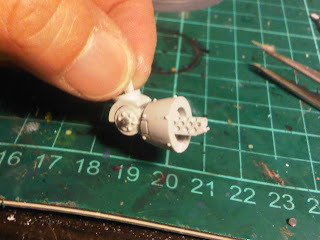 I’m very pleased with the results especially since the whole build utilized GW parts with the exception of the tip of the assault cannon barrel. 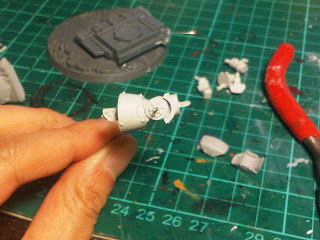 Managed to prime the model with resin primer/black basecoat. 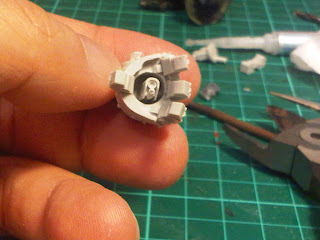 The bottom of the head which sits inside the curiass collar has also been magnetized for head movement. 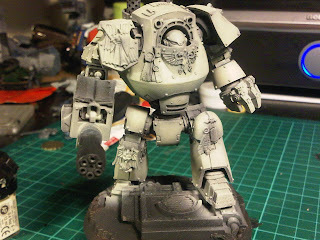 I managed to get 2 coats of paint airbrushed into my Contemptor Dreadnought. 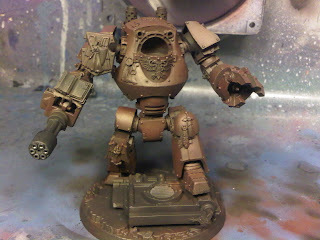 After the matte black basecoat, I airbrushed on scorched brown which made my model look like a chocolate followed by bleached bone. 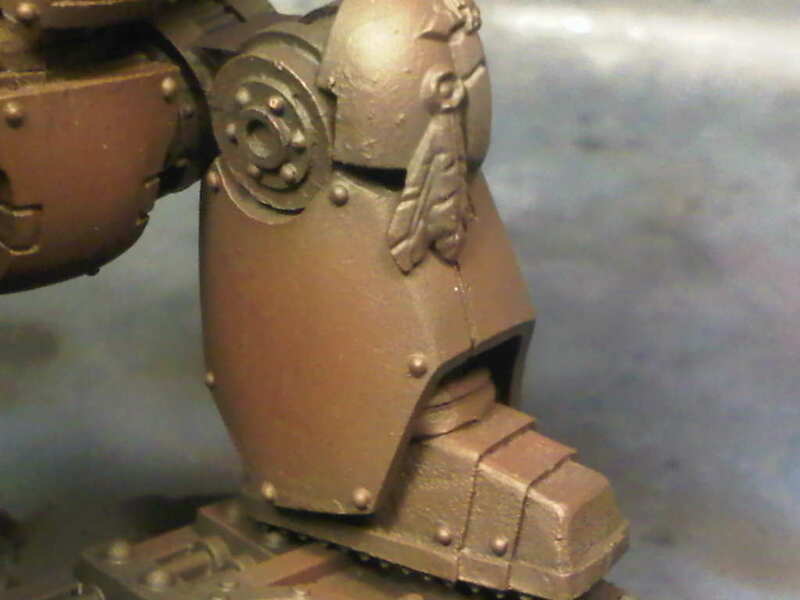 As you can see, some areas around the joints I have purposely left black/brown for the boltgun metal colored bits. I wanted to give the model a richer sense of color depth by doing brown first followed by bone. 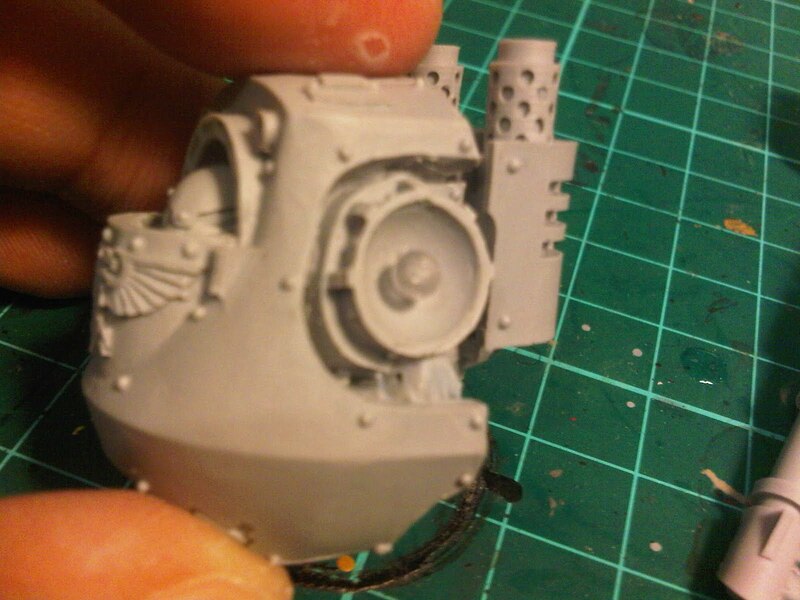 As you can see the effect is kinda weird. It looks more like rotting flesh/nurgle/death guard color than deathwing bone. 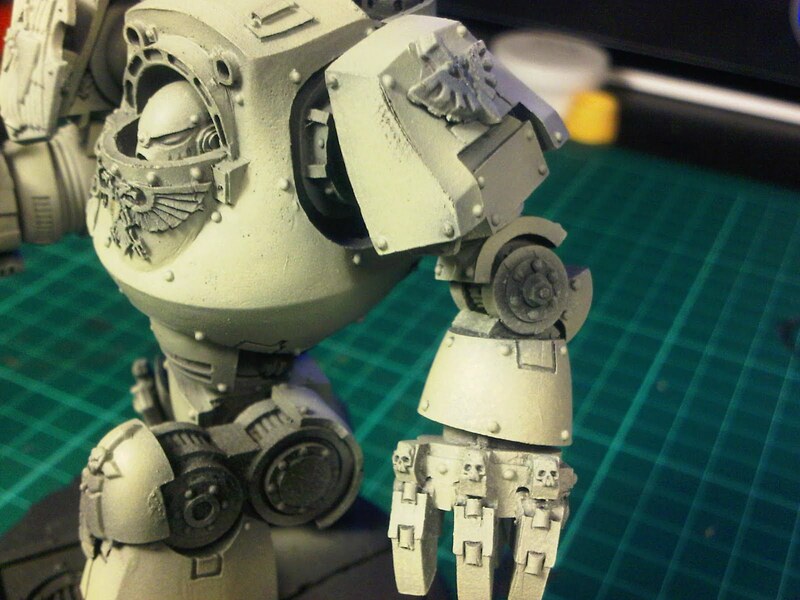 I think tonight I will try remedying this by doing diluted layers of devlan mud in successive layers to build up the tone I’m looking for. Exactly what are you using for joints here ?